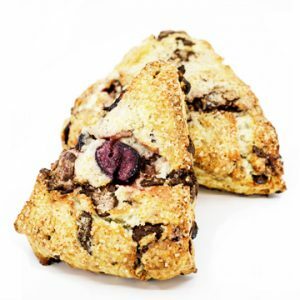 Our founder's niece named Quinn Ruby inspired this sweet and simple scone, with fresh cherries, semisweet chocolate chunks and Madagascar vanilla bean. Beverly Hills, Brentwood, Century City, Culver City, Downtown LA, Hancock Park, Marina Del Rey, Playa Vista, Santa Monica, Venice, North Hollywood, West LA, West Hollywood, and Westwood. Contact us about other delivery options or free pick up!